This post goes through Grit as though we were reading it together in a book club. I begin with a summary and then progress to discussion topics with my answers. Feel free to skip to headings that mean the most to you (especially if you are reading on the go or haven’t read the book yet). Grit is passion and perseverance for a long-term goal. Grit means choosing an interest and fostering it until becomes a goal, then deciding to work towards that goal consistently and across time. Gritty people stick with one thing for a long time and work to get better despite obstacles. 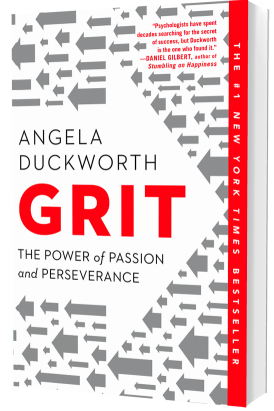 In this book, Dr. Duckworth explains that Grit is the best predictor of success basically every time it’s measured. This book does not go into huge detail about the process of success or how learning itself works, but it does touch on them as a good intro or review. It deals more with what being gritty means for the people it describes. You can learn whether you are gritty, how to increase your grit, and what it feels like to work towards such immense goals. There are, of course, many factors that go into success (access to resources, luck, and more). Most people are concerned with talent. But it’s your ability to last the journey that will most help you achieve your goals. Why? Because everyone trying to improve faces challenges, and working through challenges takes more than talent, resources, or luck. The long and complex journey to achievement relies on consistent and deliberate effort over really really long periods of time. The skills we seek to develop are so complex that no one is born being able to do them. So, all people who become experts in a field must have worked to improve and have, at some point, faced being asked, “to do things they couldn’t yet do” (8). When that happens, talent won’t help you. For West Point cadets, for instance, “rising to the occasion had almost nothing to do with talent. Those who dropped out of training rarely did so from lack of ability” (7). When you inevitably struggle during this journey of improving, grit (not talent) is what will get you through these obstacles, plateaus, or setbacks. Furthermore, even if the journey were straightforward and without obstacles (it’s not), it is still very long. It takes great endurance to last decades in one pursuit, but that’s how long it takes to become truly great at something. As you get farther into training in a field (years or more into training), you can more clearly see how effort easily overtakes “talent” or any other concern for potential. As Dr. Duckworth says, “effort counts twice.” No one is born able to to play an instrument, so everyone has to improve. And improvement only happens through effort. Gritty people succeed because they have the endurance to put in the effort. Luckily, Grit is learnable and changeable. “On your own, you can grow your grit “From the inside out”: You can cultivate your interests. You can develop a habit of daily challenge-exceeding-skill practice. You can connect your work to a purpose beyond yourself. And you can learn to hope when all seems lost. “You can also grow your grit “from the outside in.” Parents, coaches, teachers, bosses, mentors, friends–developing grit depends critically on other people” (269). Here is the Grit scale so you can get your score. Be honest. Your score is only feedback about where you are so far. If you decide to be grittier, you can be. I really liked how Anson Dorrance at UNCCH has his players fill out the Grit scale each year and look at their score. This lets them be honest with where they are and whether they are changing. He notes that sometimes this “exposes them” (255). But this isn’t a scary thing. What’s great about this is it lets you check in on your progress just like you would with anyone other aspect of your playing. There is no shame in not being gritty. Furthermore there is no shame in not wanting to be gritty. But if you decide you want to improve in your field or, within that you want to improve your grit, don’t be afraid of discovering you aren’t gritty enough yet, just resolve to change it. What does Grit Look Like? Grit is passion and perseverance for a long-term goal. As Dr. Duckworth explains, “passion” can be a bit of a misnomer and can be an intimidating word. “None of the [grit scale] questions ask how intensely you’re committed to your goals […] Rather than intensity, what comes up again and again in their remarks is the idea of consistency over time” (59). “For so many grit paragons, the common metaphor of passion as fireworks doesn’t make sense[…] Fireworks erupt in a blaze of glory but quickly fizzle, leaving just wisps of smoke and a memory of what was once spectacular. What [a gritty person’s] journey suggests instead is passion as a compass–that thing that takes you some time to build, tinker with, and finally get right, and that then guides you on your long and winding road to where, ultimately, you want to be” (60). “Grit isn’t just working incredibly hard. That’s only part of it […] Developing real expertise, figuring out really hard problems, it all takes time–longer than most people imagine. And then, you know, you’ve got to apply those skills and produce goods or services that are valuable to people […] Grit is about working on something you care about so much that you’re willing to stay loyal to it” (54). “Enthusiasm is common. Endurance is rare” (58). Passion for a goal, like love for a person, is a choice. Committed people choose a partner to love, and vow to choose their partner over and over again as they both change. Even if everyday isn’t fireworks and even days when you fight. If music is your passion, it doesn’t mean you never feel frustrated with it. It also doesn’t mean your life is ruled by an overwhelming constant obsession with music. It doesn’t mean ecstacy everytime you perform or practice. Passion for music just means that you choose to spend time and energy understanding your craft. And you keep choosing it most days, even the ones where you are tired, frustrated, or not improving, for a really long time. It means you stay curious and foster this interest as best you can, because you decided that you want to, and you keep deciding that. Many students struggle with whether they belong in music or whether they have the endurance for it. No one can tell you if this is your passion except you. And it’s not something you know or intuit, it’s something you have to choose. Dr. Duckworth says of Jeffrey Gettleman finding his passion, “it wasn’t a process of passive discovery–of unearthing a little gem hidden inside his psyche–but rather of active construction. Jeff didn’t just go looking for his passion–he helped create it” (59). That creation takes time. It is built of small interest-stimulating experiences that eventually culminate in a passion. If you want it to. Jeff could have chosen to pursue any number of other interests. You have the same choice. Or, more accurately, the same choices. Every day you can choose what interest to foster. Teachers and mentors around me often discussed talent even when saying to practice and I was constantly afraid I wasn’t talented enough, afraid I wasn’t practicing enough, and confused about how talent and practice related. As Dr. Duckworth mentioned in chapter 2, we often say working hard is most important, but then value and reward “talent.” This is not something that Dr. Duckworth goes into great detail exploring, but I think a part of explaining this phenomenon is our misconception of talent. Misconceptions of Talent : What do we even mean when we say talent? Why is talent an unhelpful concept? I think sometimes we mean starting or natural or untrained ability. Other times we mean literally skilled. And still other times we mean skilled at improving. And we conflate those without even realizing it (which is probably what makes us think talent is so important). Conflating these ideas makes it confusing for anyone who is trying to improve or even believe they have the potential to improve. It also makes students feel they don’t have a fair shot if they aren’t talented. When we look at “talent” we see a higher starting ability, ability regardless of effort, and higher rate of improvement with effort. That’s a daunting competitor. Luckily, it’s one that doesn’t exist. That’s not really an accurate interpretation of how improvement works. Regardless of starting ability, we improve through effort, through deliberate practice. And practice is a skill. It’s a process we all can refine and improve at. Expert level skill in anything only comes through skill development. And skill development comes most quickly from the very learnable process of deliberate practice. Practicing this way can outpace any starting ability advantage or sheer number of unfocused hours. When someone improves quickly, we say it is because they are inherently talented. But often, they just found this more efficient way of learning. And while some people may naturally be better learners, or others have the resource of mentors who guide their effort, we can all cultivate the ability to practice deliberately. We can all learn how to learn. The deliberate practice model and the things any of us need to do in the practice room, are, as Dan Chambliss is quoted, “dozens of small skills or activities, each one learned or stumbled upon” (36). “There is nothing extraordinary or superhuman in any of those actions; only the fact that they are done consistently and correctly, and all together, produce excellence” (36). Improving in the practice room doesn’t feel like a montage with a surge of energy, lots of excitement, fireworks, and a fun soundtrack. It feels slow and meticulous, and requires the different energy of thoughtfulness and curiosity. That’s why it takes grit. Your favorite musicians aren’t superhuman in their musical ability. They are above average in their willingness to deliberately practice minute aspects of musical skills. They can keep themselves interested in these average and mundane exercises that create elite and extraordinary skills and achievements. As Ericsson and Dr. Duckworth would say, having the grit to work the learning process well is true secret of achievement. Not thinking practice is fun doesn’t mean this can’t be your passion. Again, passion is a choice you can make, and deliberate practice takes tremendous effort. But interesting and easy and fun are all separate ideas. You can cultivate an open curiosity about a topic you like during these practices so that even though they are hard and decidedly not fun, they can be interesting. And even when they aren’t fun, you can do them anyway. “[Olympian] Gaines told me he once tabulated how much practice it took to develop the stamina, technique, confidence, and judgement to win an Olympic gold medal. In the eight-year period leading up to the 1984 games, he swam, in increments of fifty-yard laps, at least twenty thousand miles. Of course, if you add in the years before and after, the odometer goes even higher. Being gritty takes effort, just like anything else. But we can use our culture, community, and identity to help us keep going. “The real way to become a great swimmer is to join a great team” (246, Dan Chambliss quoted by Dr. Duckworth). “Look when I started studying the Olympians, I thought, ‘What kind of oddball gets up every day at four in the morning to go to swimming practice?’ I thought, ‘These must be extraordinary people to do that sort of thing.’ But the thing is, when you got to a place where basically everybody you know is getting up at four in the morning to go to practice, that’s just what you do. It’s no big deal. It becomes a habit.” (246-7, Dan again). “Over time and under the right circumstance, the norms and values of the group to which we belong become our own” (247, Dr. Duckworth). “Often, the critical gritty-or-not decisions we make…are a matter of identity more than anything else. Often, our passion and perseverance do not spring from a cold calculating analysis of the costs and benefits of alternatives. Rather, the source of our strength is the person we know ourselves to be” (248, Dr. Duckworth). Finally, I want to take a moment and reitify that measuring grit, your current ability level, or any other metric says nothing about your self-worth nor your potential to succeed. If you are unskilled now, you can practice. If you lack grit now, you can grow it. And if you never develop either of those things, your life is still worthwhile. It can be easy to confuse rating your grit level or your ability to play a specific piece with a self-rating. You have worth regardless of any metric. Furthermore, constantly aiming to improve might sound like a recipe for constantly thinking you aren’t enough. But working to improve themselves is not what gritty people do. They work to improve their skills. Gritty people don’t devalue themselves when they identify flaws. They find joy or satisfaction in the process of improving rather than lamenting over what they lack. They enjoy the challenge. We will never be finished learning, because we haven’t seen a limit to how far our potential can take us. Our skill potential is, as far as we see from here, beautifully limitless. That can be scary and invalidating, or it can be exciting and wonderous. We should evaluate our playing as curious objective experimenters, not as desperate worth-seekers. If this is a feeling you struggle with as much as I have, consider talking to a teacher or counselor about relieving yourself of this inaccurate and unhelpful mindset. As Dr. Duckworth said of gritty achievers: “in their own eyes, they were never good enough. They were the opposite of complacent. And yet, in a very real sense, they were satisfied being unsatisfied[…] it was the chase as much as the capture that was gratifying” (8). 1. Goal Hierarchy in action. Making and Remaking a Goal Hierarchy: Am I using my goal hierarchy well? As Dr. Duckworth emphasizes, grit is working hard towards one specific thing, not just working hard. We need to take the time to reflect on what we want our thing to be, and I find I need to check in more than I expect. It can be easy to be so focused on achieving that you don’t realize it’s no longer important to you to achieve this particular goal. I think it can be gritty (and normal) to clarify your interests and adjust goals when you do so with awareness and purpose. Many goals use similar foundations after all. How is your hierarchy doing? Try making a goal hierarchy and then consider how it reflects your life–in terms of your dream outcomes and your current actions. Do you know what actions or goals can help you achieve your top goal? Are you actually doing them? If yes, great work, just keep checking in! If not, great work, because now you can change it! If you aren’t sure what actions will get you to the top, teachers, mentors, and even people you don’t know personally are often delighted to share information on how to adjust the pyramid even if they don’t call it that. Find the people doing the things you want to do and even ask them directly for advice when appropriate. 2. What if someone doesn’t know their top goal? Or what if it changes? How can we our or students make plans when we aren’t sure what our life philosophy is? Dr. Duckworth is adamant that you can only find a goal by actively trying things. While time to reflect is vital, we can’t just sit around waiting for inspiration to strike. Gritty people (in the book and in my life) are out there exploring the things that interest them. Many of the examples, including Dr. Duckworth, had long and varied journeys with their interests, and that is okay, and probably unavoidable (maybe even helpful) as we learn and grow. And, as Dr. Duckworth points out, there’s no lightning strike moment where people just “know,” but rather a constant exploring and refining of interest and curiosity. I’ve had many times in my life where I didn’t know my direction in any meaningful way, and it made it hard to find motivation for anything except hanging out with my cat while we watch tv and eat cookies. Which is a great life, but not the one I want. So, while I absolutely recommend reflection, cats, and cookies, also make time to be curious about and engaged in the world. This doesn’t mean frantically trying everything until you fall head over heels over something. Just make time to keep doing activities you enjoy, keep looking for new activities you might enjoy, and, in the meantime, keep trying to improve somewhere. Take the things (however varied) you find interesting, and allow yourself time and opportunities for “a succession of interest-stimulating experiences” (101) in those areas. When we are lucky (and strategic), interest and challenge (practice) and improvement can go hand in hand (in hand). Finally, it can be hard to find motivation to practice if you aren’t sure this is your top goal. But being a side interest and applying effort aren’t mutually exclusive. Even if you change your mind about being a career performer, those hours in the practice room aren’t a waste. First, we can (try to) bring open curiosity to those long hours so they are interesting even when they are hard. Most importantly, remember that Dr. Duckworth says we don’t all have to be Einstein or Mozart or Simone Biles to do worthwhile work in science, music, or sports. In Peak, Ericsson describes the journey to expertise like climbing a difficult mountain. Perhaps your goal is not actually the top (expertise), but some other nice point along the route. Whatever your goal with an activity, working hard by practicing deliberately is like traveling with a map or guide to your stopping point instead of wandering aimlessly. You can enjoy the view and follow a map at the same time. And just because you don’t reach the top doesn’t mean your journey or your lower destination aren’t worthwhile. So, in the meantime, if you are struggling with how to prioritize your improving/practicing with exploring interests, I think start by saying yes to things that interest you and then commit to developing that interest for at least the short term future.. Anything you say “no” to, say it because it doesn’t interest you as much as other things. Anything you say “yes” to, commit to some regular and deliberate practice. And then remember to check in with yourself about which things interest you. Just a small aside that I love her pillars of Interest, practice, purpose, and hope. These are great guide posts to check in and see if you are using your grit in a meaningful way for your life, and if you are staying balanced. Am I fostering my interests with open curiosity? Am I practicing the right things in a productive (deliberate) way? Am I fostering my purpose and relationship to my community in a curious and interested way? Do I feel hopeful and optimistic that I have the potential to achieve my goals? 3. How do we balance encouraging improvement with encouraging interest in our students (or in ourselves)? How do we keep students interested while getting them to practice and improve? Is it different with students of different ages and ability levels? It seems like grit refers to continual work and continual play. Work to improve and play to stay interested. Like wise/authoritative parents, it is our job then, to both foster interest and demand students put in effort. But these are not mutually exclusive things. “There’s no either/or trade-off between supportive parenting and demanding parenting. It’s a common misunderstanding to think of “tough love” as a carefully struck balance between affection and respect on the one hand, and firmly enforced expectations on the other.” The families in Dr. Duckworth’s examples, “clearly put their children’s interests first, but neither family felt that children were always the better judge of what to do, how hard to work, and when to give up on things” (211). With younger students the main objective is fostering interest and getting them used to spending time on their instruments. As students get more advanced, we can gradually add in more details and teaching them how to deliberately practice. But even advanced students (including us) still deserve to foster their interests. “Before hard work comes play …developing an interest requires time and anergy, and yes, some discipline and sacrifice. But at this earliest stage, novices aren’t obsessed with getting better ” (106). Here’s the key, though: Interesting doesn’t mean easy, and it doesn’t even mean fun. I had a student tell me once that they didn’t mind that instruments were hard because if they were easy they wouldn’t be interesting and then why would we even bother? Our best learning happens at the intersection of things that challenge us, and things we can realistically accomplish–and things that interest us. Fostering an interest and improving can happen simultaneously if we let them and if we use our brain’s love of novelty. Our brain finds new things interesting and when we find things interesting, we invest time and attention. With that time and attention we can learn to see new details. These new details can be interesting (novelty) and start the cycle all over again (interest). “For the expert, novelty is nuance” (114). This works in multiple ways. Experts see small details (nuance) because they spend time with things they deem interesting. When they see small details, these novel experiences facilitate their ability to stay interested in something long-term. They also continue to spend time with the same things because they discover novel reasons to be curious. Therefore, I hope to guide students towards the skill of understanding nuance in playing, while also encouraging them to see nuance as interesting. It may be that gritty people continually try to improve because that’s where interesting things happen. Curiously ask, how can I do this better? What do I want to be different? These are the foundations of deliberate practice as well as examining nuance. It can be fun to do something easy, but interesting to keep challenging yourself and gritty people continually improve because of their ability to stay interested. 4. Deliberate Practice vs. Flow: What Does this Mean for My Practice Time? We had three types of practice described in this book. Here is a review if you forgot: How do these types of practice relate? “Deliberate practice is a behavior, and flow is an experience” (131). “Gritty people do more deliberate practice and experience more flow” (131). While deliberate practice is effortful, exhausting, and even unenjoyable, “The flow state is intrinsically pleasurable. You don’t care whether you’re improving some narrow aspect of your skill set. And though you’re concentrating one hundred percent, you’re not at all in “problem solving” mode. You’re not analyzing what you’re doing: your’re just doing” (132). First is deliberate practice, where we actively rate and improve specific aspects of our playing. Second is practice being in performance mode, where we actively don’t want feedback and instead try to effortlessly access the skills we’ve curated (flow). Third is using practice performances for feedback on what needs our attention during deliberate practice (1), and how well we are able to enter performance mode (2). As the spelling bee kids found, practice quizzes “may have been a necessary prelude to doing more targeted, more efficient, deliberate practice” (126). It can be hard to say an ideal balance between type 1 and 2. But I use type 3 to give me an idea of how much of my time should be spent in types 1 or 2. If I have trouble staying focused, I need more work on type 2. If I can’t perform a technique when nervous, perhaps I need more of type 1. We need to practice both the piece and the performance of the piece. Similarly like you need to study (specific material), you need to practice your test taking skills (generally), and you need to take practice tests to see how well the material is sticking after you studied it. I do want to clarify that though experiencing flow is not a behavior, it is something we can cultivate. After all that time analyzing our practice, we need to practice not analyzing. We practice controlling whether we want to be in analyzing mode or playing mode. If we only do deliberate practice, it will be difficult to do anything different than that on stage. For the third type of practice (“practice quizzes”), I rely on recordings and feedback from trusted sources. Just like deliberate practice in general, the feedback should be immediate and specific so that you know how to make changes to the other aspects of your practicing. 5. Balancing a passion and a purpose: How do I find my purpose? I’ve heard many successful people attribute success to the ability to merge their skills with ways to serve others. I always thought these people had to sacrifice their interests or were just lucky in having interests that could serve people. I remember feeling envious that they found this intersection just as you can be envious of people who find their passion. I even remember selfishly trying to find ways to say I was serving others that would really just let me do the performing I wanted to do. Now though, I see the intersection of passion and purpose as something mutually beneficial. Our purpose can be interesting to us and helpful to others. But just like our passion, purpose can be hard to find. Like interest and passion, purpose has to be cultivated and created, and can’t be forced. My purpose (perhaps still written in pencil at the top of my purpose pyramid) is helping others find a healthy and productive relationship with practice. Finding my purpose happened organically and it is something I love just as much as performing. And yet this interest started almost entirely selfishly. It is a self-indulging passion as much as a desire to serve others. I wanted to know more about how I could improve. But then, as I explored this interest, it changed. Just as Dr. Duckworth described of cultivating interest, finding this purpose happened slowly over many years as I explored and clarified my own interests. Eventually though, this information felt so powerful and relatable that I felt the need to share it with others. Serving others doesn’t have to be selfish or a gimmick or a sacrifice, we just need the energy and patience to match it with our interests. If you don’t have it yet, just keep trying things. Go back to the section about cultivating interest and plug in the word “purpose.” It’s okay if you don’t have it yet, as long as you curiously look for it instead of waiting for it to find you. 6. What information can we apply to our music studio culture about grit? “Look when I started studying the Olympians, I thought, ‘What kind of oddball gets up every day at gour in the morning to go to swimming practice?’ I thought, ‘These must be extraordinary people to do that sort of thing.’ But the thing is, when you got to a place where basically everybody you know is getting up at four in the morning to go to practice, that’s just what you do. It’s no big deal. It becomes a habit.” (246-7, Dan again). “So it seems to be,” Dan concluded, “that there’s a hard way to get grit and an easy way. The hard way is to do it by yourself. The easy way is to use conformity–the basic human drive to fit in–because if you’re around a lot of people who are gritty, you’re going to act grittier” (Dan 247). “Over time and under the right circumstance, the norms and values of the group to which we belong become our own” (247). “Often, the critical gritty-or-not decisions we make…are a matter of identity more than anything else. Often, our passion and perseverance do not spring from a cold calculating analysis of the costs and benefits of alternatives. Rather, the source of our strength is the person we know ourselves to be” (248). Instead of trying to remember why we shouldn’t quit, we think, I am a person who doesn’t quit. Instead of calculating why we need to practice today, we think, I am a person who practices. More than just building grit, we can use culture to build healthy deliberate practice habits. eg: In this studio, we take care of our bodies, we plan for a healthy amount of sleep, we focus fully when we practice, we don’t complain about having to practicing, we stretch and ensure practice breaks in our schedule, or anything else you want your studio to have. Coach Dorrance is quoted, “If you want to create a great culture, you have to have a collection of core values that everyone lives” (256). I’ve been in a mix of studio atmospheres, some of them very good. But I don’t think I’ve been in one with core values and unification. Perhaps that is something missing from the studio environment. Studios are often filled with very diverse people, with different career goals (in and out of music), different musical goals and styles, different ages and ability levels. And yet the metaphor researcher Anders Ericsson uses about improving comes to mind. He says, improving is like climbing a large and confusing mountain. Even if you don’t want your journey to end at the peak, it can travel more efficiently with the guide of deliberate practice. How to we actually get members of a culture to actually live these values? I think Anson’s memorization activity worked because it forces you to actually consider what it is you say your values are. You take an abstract quote and practice applying meaning to it from the context of your own experience–that is, you practice applying that core value. We don’t need to use quotes, but we should be practicing applying these values together. Anson is quoted about his intense exercise test, “If you do well, either you have self-discipline because you’ve trained all summer, or you have the mental toughness to handle the pain that most people can’t. Ideally, of course, you have both” (256). Good leadership for West Point Cadets means, “when they fall short of meeting the academy’s extraordinarily high standards, figuring out the support they need to develop” (259-60). This idea also normalizes the learning process. “Starting strong is easy” it’s staying strong through the finish that’s hard (266). 7. How can we build communities of grit after we have graduated? This is an important question that doesn’t get enough attention, and one I don’t pretend to have the full answer to. It can be hard when we don’t have a fixed studio or school or ensemble in place and many of us do not. My best answer is choosing a group of peers you trust to have similar work ethics and ambition-levels. Talk to them regularly and honestly about your progress and experience the same way you would a teacher or studio member. Normalize that experience to create a cohort experience for the other people as well. Think of the best types of help you got in school (or the types you wish you had) and create those experiences with others outside of school. We have so much technology and access to our peers now that we don’t have to be in this journey alone.